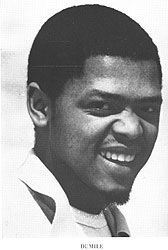 Zwelidumile Geelboi Mgxaji Mslaba “Dumile” Feni was born on 21 May 1942 in Worcester, Western Cape. His mother died when he was only five or six years old and he went to live with relatives in Cape Town until the age of eleven. He then began working for his father, a trader and preacher. While travelling, Dumile continued to exercise his childhood passion for carving and drawing. In the early 1950s he moved to Johannesburg and began working as an apprentice at the Block and Leo Wald Sculpture, Pottery and Plastics Foundry in Jeppe. In 1963 and 1964, while a patient at the Charles Hurwitz South African National Tuberclosis Association (SANTA) Hospital in Johannesburg, Dumile was given art materials. It was in this way that he began his drawing career in earnest. Together with Ezrom Legae, he decorated numerous walls in the hospital. He received support from Lionel Abrams, Bill Ainslie and Barney Simon. Dumile exhibited successfully for a number of years in Johannesburg and was selected as one of the artists to represent South Africa at the 1967 Sao Paulo Biennale. However, he was severely criticised by his fellow artists in Durban-where he was living at the time- for being disposed to represent the apartheid regime on an international exhibition. On his return to Johannesburg and faced with the prospect of being deported to either Queenstown or Worcester under the notorious Pass Laws, Dumile decided to go into voluntary exile in London. He arrived there at the beginning of 1968. In London, Dumile again enjoyed success and recognition, showing his work among other exhibitions, at the Grosvenor Gallery and Camden Art Centre. Figure 1: Study for the portrait of Albert Luthuli. In 1979 he decided to go to the United States. He journeyed first to Los Angeles and then New York, where he spent the last decade of his life. Although Dumile did exhibit in New York, his income derived mainly from designing record covers, posters, calendars and illustrations in books. In 1991, shortly before his planned return to South Africa, he died from heart failure while shopping at his favourite music store, Tower Records in New York. His body was returned to South Africa and he is buried in Johannesburg. Described while in Johannesburg as the ‘Goya of the townships’, Dumile found his subject matter in the life and events he observed around him. Working primarily with graphic art in monochromatic hues, the artist had the ability and vision to transform the particular into the universal. His works also reflect his deep love of music, especially jazz. And even the disposition of the figures on the page is invested with musical rhythm. Dumile was also an exceptionally gifted sculptor, skill that is clearly expressed in his art. Though executed entirely in a linear fashion, many of his drawings have a profound sculptural quality. The Study for the portrait of Albert Luthuli is an excellent example of this. It does not attempt to depict the final three-dimensional sculpture; instead, the drawing itself has intrinsic attributes to sculpture. Albert Luthuli was a Zulu chief, teacher and religious leader that became president of the African National Congress from 1952 to 1967, and was the first African winner of the Nobel Peace Prize for his efforts in waging a non-violent campaign against racial discrimination in South Africa. While in London, Dumile began working on this subject. Eventually he completed at least a drawing and two bronzes of this African icon. Dumile’s portraits are not conventional. And the Luthuli project is no exception. Rather than depicting naturalistic likeness, both the drawing and the sculptures are symbolic portraits of a great leader and a wise and noble man.